Christmas comes early to The Marple Band with a huge donation of £3,430. On Saturday 25th November, we played at the Co op in Marple at their celebration day to end their latest fundraising session. Three local charities benefited from the Co-op membership charity scheme and the 1% that they donate from total purchases made. This resulted in a staggering £3,430 that was presented to the band for our new uniforms. The Marple Band sends a huge thank you to all our supporters who nominated us as their chosen Co-op charity. It is fantastic that a local organisation has made such a massive contribution. 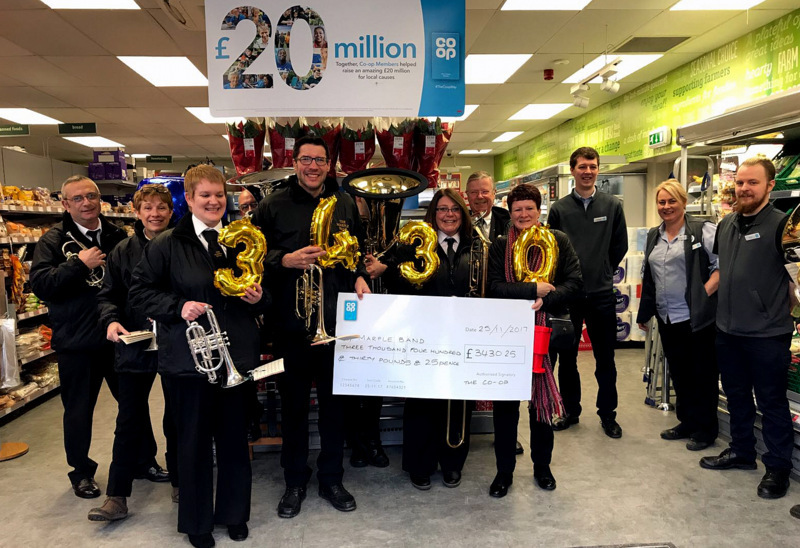 At the celebration, the band played some festive music and customers also donated another impressive £92. In total the Co-op have contributed £3,522 to our uniforms. Along with our sponsors, other generous donations, grants and fundraising events, we have now achieved our target and will be ordering our new uniforms very soon. Thank you all so very much, but especially to Ruth Groves for her immense contribution in coordinating and driving forward all our uniform fundraising. The band has many community events and concerts in the run-up to Christmas, not least our annual family concert at Marple Conservative Club on Friday 22nd December at 7:30pm. Please come along and help us celebrate.